Following the recent hits Masquerade (2012) and last year’s The Face Reader, period films are set to make a big push into the Korean market in 2014 with at least six big Joseon era films poised to flood the market. Getting the ball rolling in the new year is the action comedy The Huntresses, a film initially set to debut last spring but rescheduled by distributor Showbox when the project needed more time to complete digital work in post-production. Entering a crowded Lunar New Year field alongside Miss Granny, Man in Love and Hot Young Bloods, the film is hoping to draw in family crowds with its fun premise and trio of female stars. Three girls are trained in martial arts and become the top bounty hunters in Joseon era Korea when they grow up. 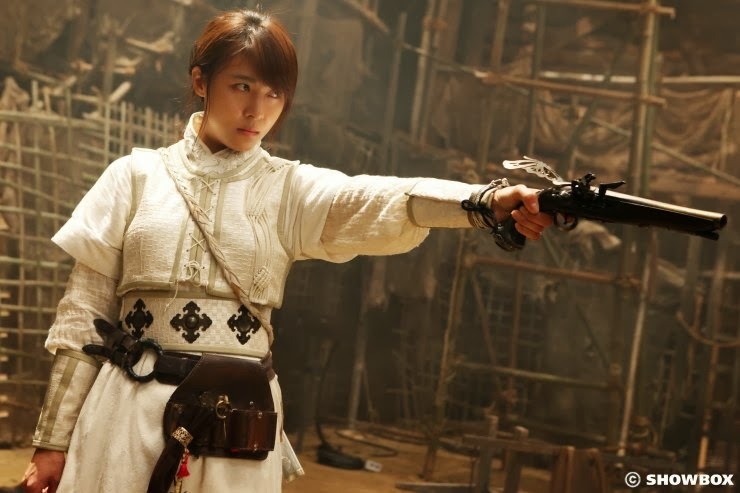 Leading the group is Jin-ok (Ha Ji-won), who witnessed her father’s demise and narrowly escaped her own death at a young age. She is joined by the fussy Hong-dan (Gang Ye-won) and Ga-bi (Son Ga-in), the stoic cadet of the trio. Together they must fight a plot to usurp the throne and gain absolute power over the kingdom. Sadly, The Huntresses fails to be the fun romp it intended to be. Though the project showed promise when its colorful teaser debuted a year ago perhaps the writing was already on the wall when the film was pushed back indefinitely. If it needed time to complete its visual effects work, it certainly doesn’t show in the final result as weak green screen effects and overcompensation in the editing department mar the handsome camerawork and production design that was already captured during filming. The film is at its best early on as it presents itself as a period Korean version of Charlie’s Angels. Fun, colorful and very tongue-in-cheek, suspension of disbelief is immediately instilled and the comic turns of co-stars Go Chang-seok and Song Sae-byeok add a few laughs to the mix. Though not a riot, it’s serviceable and had it stayed in this vein it might have made for decent entertainment but, predictably, the film takes some more serious turns and tries to wean some melodrama from its flimsy backstory. It’s bad enough that this happens within the ludicrous world the filmmakers have created but when the leads have to play it straight while donning some preposterous, over-detailed and woefully anachronistic outfits it becomes impossible to take seriously. Ha Ji-won is in her standard cute girl action mode, which has worked well for her in the past in films such as Lee Myung-se’s Duelist (2005), but in The Huntresses those characteristics are overplayed and she can never quite find her footing. Ha may not be one of Korea’s strongest dramatic players but this kind of film should be a great match for her specific acting style so it’s a shame to see her wasted. Perhaps the fault lies in director Park Jae-hyun, who previously directed four smaller films that I’d never heard of before, as Ha’s co-stars Gang Ye-won and Son Ga-in seem equally at sea in the material. As the henpecking Hong-dan, Gang’s caricatured performance has none of the fun she previously demonstrated in films like Ghost Sweepers (2012), though admittedly her characters are usually quite histrionic. Son, a member of K-pop group Brown Eyed Girls, fares worst of all with a steely performance that is more vapid than cool. Only Go and Song, seasoned character performers with defined performance styles, are able to rise above the material. Despite a few moments that come together here and there, The Huntresses is largely a poorly plotted misfire that clumsily mashes genre codes together and transparently covers up its many pacing problems with frenetic editing. Climaxing with the double-fisted climax of a laughable melodramatic death and a terrifically misconceived action set piece, this is one period action film that will have no problem becoming a distant memory.